* TRACK YOUR PAST: using nothing more than a pen and paper, create a clear, comprehensive, and organised record of your thoughts and goals. * ORDER YOUR PRESENT: find daily calm by prioritising and minimising your workload and tackling your to-do list in a more mindful and productive way. * PLAN YOUR FUTURE: establish and appraise your short-term and long-term goals, plan more complex projects simply and effectively, and live your life with meaning and purpose. The system combines elements of a wishlist, a to-do list, and a diary. It makes it easy to get thoughts out of your head (an unreliable witness) and onto paper, to see them clearly and decide what to do about them. It helps you identify what matters, and set goals accordingly. By breaking long-term goals into small actionable steps, users map out an approachable path towards continual improvement, allowing them to stay focused despite the crush of incoming demands. But this is much more than a time management book. It's also a manifesto for what Ryder calls "intentional living": making sure that your beliefs and actions align. 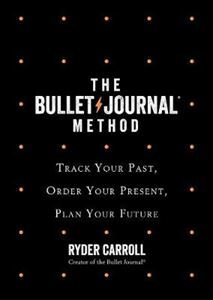 Even if you already use a Bullet Journal, this book gives you new exercises to become more calm and focused, new insights on how to prioritise well, and a new awareness of the power of analogue tools in a digital world.